This outcome was expected as the Viet turnout yesterday was very high while Latino voters appear to have slept through the election. Mailed in ballots are also still being counted thanks to a law that Correa helped pass, Senate Bill 29, that will allow ballots received by mail up to three days after yesterday’s First District Special Election to be counted. If Do does end up winning outright it will mean that only one Hispanic legislator will remain in Central Orange County – U.S. Rep. Loretta Sanchez. The Assemblyman in the overlapping 69th Assembly District is Tom Daly – a Democrat who is not a Latino. The State Senator for the area is Janet Nguyen, who Do will presumably be replacing on the Orange County Board of Supervisors. Correa’s apparent loss is a huge slap to the face of the Democratic Party of Orange County and the labor unions, particularly the Orange County Employees Association (OCEA) which has spent a vast fortune over the past few years but has mostly seen zero results as their selected candidates in the big races keep losing. Lou always had a very uphill battle. Voter registration favored Republicans. 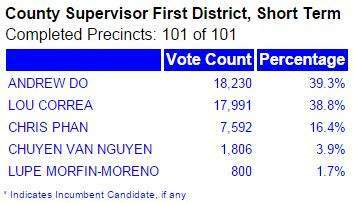 If Lou or his handlers hadnt thrown in the 2 Viet candidates, Do would have trounced Lou even without Lupe Moreno. Lou lost this race when Janet redrew the District. Lou can still win and if he does, it’s a miracle. All true but Lou blew it by not attacking Do.